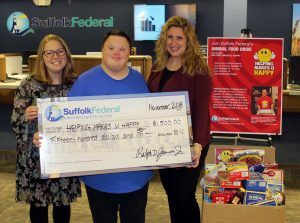 Suffolk Federal recently hosted its 10th Annual Food Drive to benefit Helping Makes U Happy, a nonprofit organization located in Center Moriches dedicated to providing much-needed assistance to families in need. The organization has held projects including food drives, school supply drives, clothing drives and so much more. Through the generosity of its membership and employees, Suffolk Federal collected nearly 500 pounds of food donations along with an additional $1,500 monetary contribution which will provide holiday meals to families in need. Suffolk Federal offers all members’ incredible benefits like free checking, free online banking, low interest rates on home and auto loans and much more. Visit www.suffolkfcu.org, call 631.924.8000 or visit any Suffolk Federal branch today.